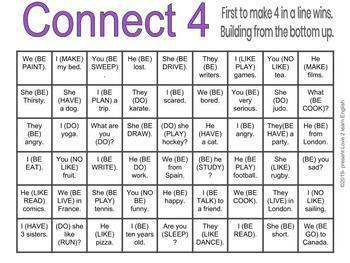 The aim of this game is for students to improve fluency, fast thinking and grammar skills. In the game they must decide which tense to use, simple or continuous/progressive form. 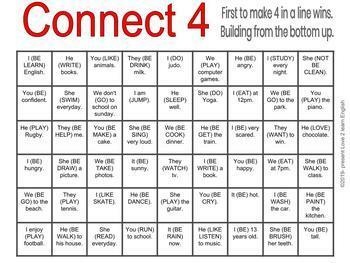 It can be used for either present tense of past and with 3 different boards included you will get a lot of use from these games. 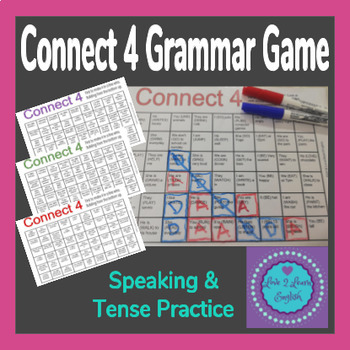 Students will practice how to tell the difference between one tense and another. How to play-Start on the bottom row and build upwards just like the original Connect 4 game. Pick a square. Look at the sentence inside and decide if the verb should be simple or progressive/continuous. If correct you win the square. If not, you don't and its the other players turn. First player with 4 in a line wins. Teachers notes- explaining set up and rules. 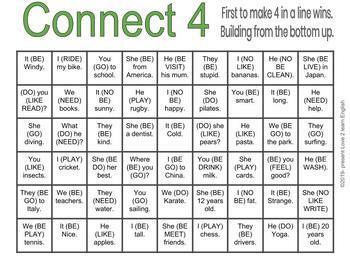 Great fun for all ages and mixed levels of language and a great warm up or cool down activity.